Letters will be mailed in Canada on Thursday or Friday. We send mail via Canada Post as well as via the United States Postal Service. For Canadian missionaries, this means that your letters can be mailed using the stamps that your supporters expect to see. It's also cheaper than mailing from the US to Canada. Every two weeks, we send a package of letters to Windsor, Ontario, which are then mailed in Canada directly, without going through the US Postal Service. These letters all have Canadian stamps (they're not metered mail), and you can use a Canadian delivery and return address without having to include the country name, as you would if they were mailed from the United States. We ship the letters on Monday, and they are subsequently mailed in Canada on Wednesday or Thursday. In case of inclement weather, some packages may get delayed until Friday. In order for your order to be included in a delivery, it should be ready to print by Monday morning on delivery weeks. Please send your order a weekday or two earlier if you want a preview or are paying by credit card (unless we have your card on file). If you want all of your letters going to Canada to be sent from Canada, go to the account settings page, where you'll see a checkbox (near your return address) with that option. Check the box, save, and you're done. If you've already placed an order and want to change it, start up a chat or contact us, and we'll be happy to make the change for you. Mail sent within Canada is $0.17/letter cheaper than mail sent to Canada from the United States. 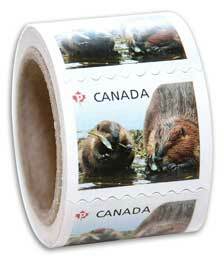 Pricing will be adjusted whenever we buy Canadian stamps, based on the current letter rate and exchange rate. Our advanced pricing page will let you choose Canada Post postage and get exact pricing for your specific mailing. You can also start a chat or contact us to get an estimate. All payments happen in US dollars. If you're a missionary with Power to Change, we can bill your account directly, and the currency conversion is handled as part of the transfer.